REMOVED FROM RANGE ROVER EVOQUE 2012 5DR DIESEL AUTOMATIC GEARBOX IN WHITE. MIGHT HAVE SOME SCRATCHES OR STORAGE MARKS. WE AIM TO RESOLVE ANY ISSUES WITHIN 24 HOURS. We might have not mentioned your town but we will contact you if prices are different to your address. Please do provide a contact number. PLEASE CALL FOR A QUOTE. THE BLACK BARN AT THE OLD MILL. NEXT TO A WORLD OF OLD. Before purchasing please make sure that the item fits your vehicle as parts correctly supplied are not refundable. Any parts damaged in transit must be reported to us immediately so the problem can be rectified. The item "RANGE ROVER EVOQUE 2012 POWER STEERING RACK 7806177560" is in sale since Tuesday, August 23, 2016. This item is in the category "Vehicle Parts & Accessories\Car Parts\Suspension & Steering\Steering Racks & Boxes". 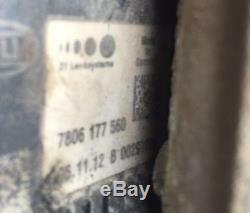 The seller is "vwbreakersukltd" and is located in WING. This item can be shipped to United Kingdom.